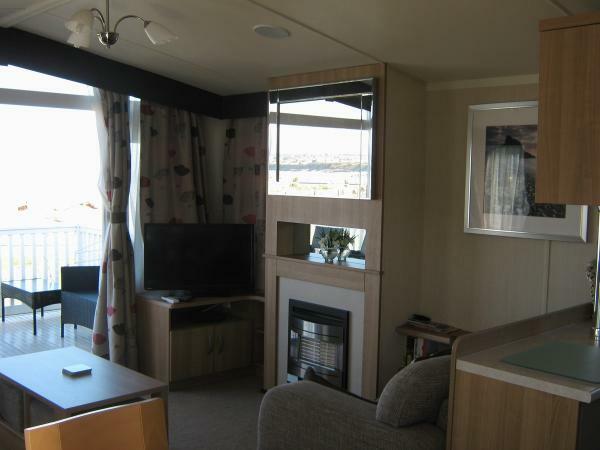 This caravan stands in its own right as a superb holiday location with wonderful sea views. Haven fun passes can be purchased separately from their reception if required. Doniford bay is one of Haven's smallest and certainly most scenic parks and over the winter there have been many improvements made with a complete refurbishment of the indoor pool and more outside children's play areas created. 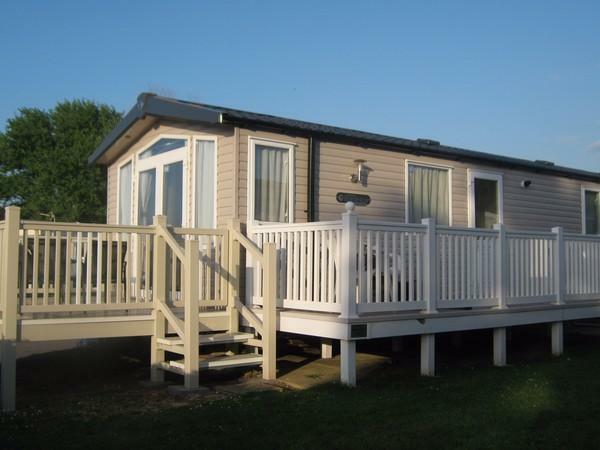 This luxury caravan is set on a front row pitch at 'Waterside' one of the prime locations on the park, not only for its magnificent sea views but also for its close proximity to the sea( please note I also have a caravan next to it, ref 1954). When the tide is in, the sea is just a few metres from the decking and occasionally during high tides you can feel the sea spray on your face. The south west facing decking now has new comfortable rattan style furniture to enhance your your experience of the changing tides wonderful sunset views; all of which I have taken from the caravan decking, except one which is from inside, you can enjoy them all just as much from the warmth and comfort inside the caravan. Just to one side of the caravan there is an open green area suitable for children to play, with steps leading down to the beach. The west somerset steam railway wends its way along the coast and the train can often be seen from the caravan decking as it chugs its way along with steam billowing from its engine and whistle blowing. In the lounge there are very comfortable four seater and two seater settees and a coffee table with two footstools beneath. 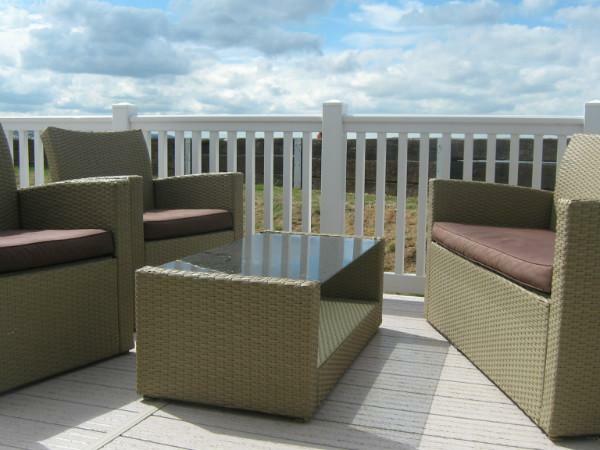 The patio doors open onto the front decking area with it's rattan style furniture with occasional table where you can relax and enjoy the sea views. The lounge also has a gas fire, a 32 inch television. The kitchen is modern and well equipped with ample units and a generous amount of work top space. There is a full sized fridge freezer, a gas cooker with extractor hood and light. It has a free standing dining table and chairs, also a microwave oven. The kitchen is light and airy with door opening onto the large side decking area with more patio furniture. 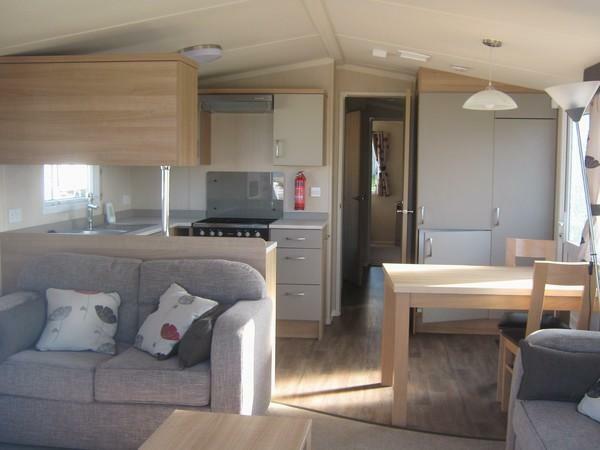 The master bedroom with en suite is a good size and occupies the full width of the caravan. It has ample wardrobe space and a television. There are two further bedrooms both with twin beds. 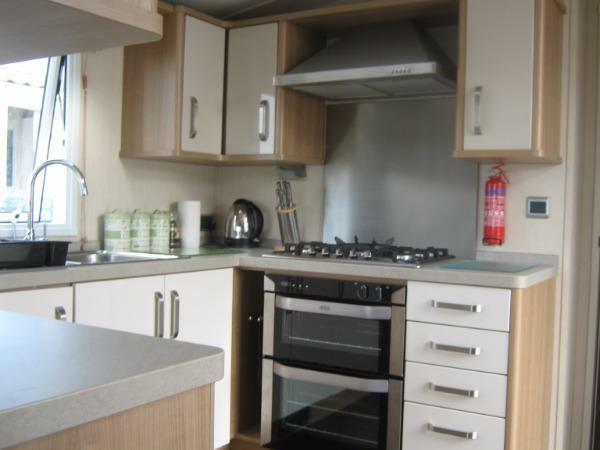 The caravan benefits from full gas fired central heating and double glazing. just returned from 1 weeks stay at this caravan and I can honestly say the caravan is excellent accommodation. Will definitely be booking again. Brilliant holiday home from home everything perfect, beautiful caravan, lovely to meet you both such lovely friendly people. We booked this caravan just a few weeks before we went, for a last minute short break. Terry the owner was very friendly and helpful. We are a family of 4, Mum, Dad and 2 sons aged 11 & 14. 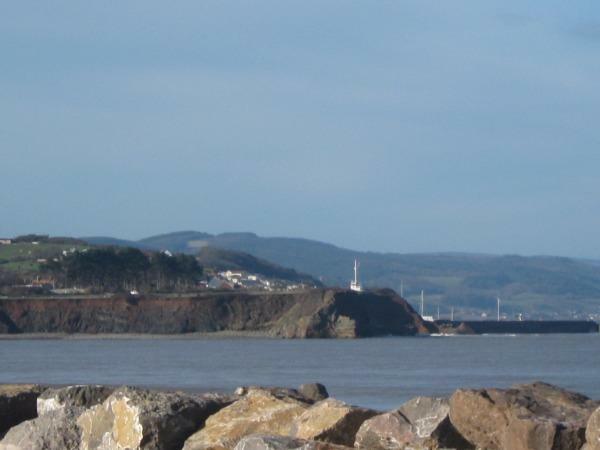 We chose it, primarily for the location and sea views, and secondly for the excellent customer service & provisions ! In that all linen was provided, and beds were made up for our arrival, along with basic essentials such as tea, coffee, milk, biscuits! washing up liquid and toilet roll! It made our short break away all the more luxurious not having to bring all the basics or having to make our own beds! All the comforts of a hotel, with the freedom of self catering! The accommodation was comfortable and the views wonderful! The site is relatively small and quiet, with a shop for supplies, play park and space to kick a football. Not to mention the "brown sea" mud flats which our younger son soon warmed too, and even found a spot to swim in! All in all, a perfect spot to "get away from it all" and definitely a cut above the rest! Thankyou so much we had a fab holiday the weather was really kind to us, the caravan was beautiful .The site was perfect for what we wanted .So many extras and nothing was to much trouble . We will be booking again your caravan is a credit to you and your friendliness makes a lovely start to a holiday . What a great caravan! Clean and tidy and thoroughly modern - and pet friendly too. I don't think I've ever stayed anywhere as pristine as this caravan (put's my house to shame :-) ). Location next to the water's edge was fantastic too, kids loved being able to hop over the wall straight onto the beach (via a few steps). Thank you Terry for letting us rent your caravan, hope to be back next year! Regards, Tony, Alison & Family. Thank you all so much it was a pleasure to have you stay. hope to see you again soon. Just back from staying in this caravan for a week. Everything you need is provided, bedding, towels and on arrival tea, coffee and biscuits. I can't fault anything about this caravan and the sea view was wonderful. The caravan was clean and comfortable. The king size bed was so comfortable we slept very well. We had a lovely time and our time was made more special staying in this lovely caravan. Thank you for so much for your very kind review Iris and Del. Although you enjoyed your stay in one of our other caravans last year, I suspect this one is your favourite. Had a great holiday again. Everything in the caravan that is needed as usual. Terry doesn't forget anything. Even the weather was good this time sitting on the outside listening to the sea was great. The park was just the same as last year with everything you need. Thanks again Terry . Always lovely to see you Merle, so pleased you enjoyed your stay look forward to seeing you again soon. We had a lovely week in this caravan. The location was perfect for watching the sun set. The caravan itself is very well appointed and Terry was very helpful in explaining the site layout. Would definitely recommend it to friends and family and hope to return. The children had a great time. Thanks Terry! We Had a great time staying in this caravan. All the extra's were provided, and we were able to get into the caravan early. Terry came round later and gave us a guided tour of the home, and also provided us with some great local knowledge of places to visit. We will definitely return and stay at a future date. Thank you Terry for letting us hire you lovely home. We had a lovely time at Doniford but the caravan made the holiday extra special as it was so homely & had everything you needed from teabags to towels! Also the view from the decking is lovely especially the sunset in the evenings! Terry also went out of his way to get a privelage card for us which got us some discount in the shop etc. We look forward to returning next year! Thank you! On our arrival to the end of our holiday was very special with staying in such a superb caravan. Terry was very welcoming on arrival and showed us round the caravan. We have stayed in many caravans over the years but we have never stayed in one that provided so many extras which was absolutely superb, so nice to be able to make a drink on arrival with coffee, tea, sugar and milk provided. It was so nice to have a bed that was so comfortable as many caravan beds are not. The views and the sunsets were amazing and it was lovely to hear the sea splashing up on the rocks. A first class holiday in a 5 star caravan, a credit to you Terry and Julie. We would certainly recommend this caravan to anyone. Wow Christine, what can We say. We are so pleased when guests enjoy their stay with us. Thank you for your very kind review. hope to see you again soon. Best wishes Terry and Julie. Thank you Avryl and Mick. I know that you very much needed a nice break. Look forward to seeing you again next year. Hi sorry this is late. Well Terry what can i say!You were so very welcoming when we arrived. What e pleasure it was to stay in your superb holiday home from home in a wonderful setting with fantastic panoramic sea views from the large decked area. The only thing missing was some egg cups Hope your leg is back to normal. A lovely welcome from Terry who showed us around the caravan. Lots of wonderful touches like towels, tea, coffee, milk and biscuits. Perfect views from the minute you get up until you go to bed. We had a wonderful week, the weather was kind to us and we will be back. Caravan was 5star luxury. Everything was there as if it was your own home. Terry was there when he was needed but gave us our privacy for the holiday . The site was very good and peaceful with friendly people. I am now looking to book two more holidays at the beginning and the end of the summer season. Thanks Terry we had a wonderful holiday. Fabulous holiday staying in the best caravan on the site. Spacious, clean and very well equipped. A warm welcome from Terry who ensured we got access to the caravan as early as possible. The view was breathtaking and changed every day especially the sunsets. The comfortable furniture on the decking helped make it a very relaxing week. We will definitely return and recommend it whole heartedly. Had a fab holiday in Doniford Bay and staying in this caravan was amazing. Terry has been nothing but helpful and kind from the moment I enquired until we left. He went out of his way to assist us and make our stay one to remember. The caravan was lovely, it was clean and tidy with beds made up on arrival. The tea, coffee and milk on arrival was fantastic. There were towels, tea towels and lots of other added things supplied in the caravan and we never felt we were missing anything at any point. It was home from home and we will be back. Thanks again!! It was a pleasure having you and your family stay with us. Fab, fab, fab! Best caravan and site we have ever stayed in. The welcome pack is a first for us and was great, caravan was a home from home, and the made up beds was a great added bonus, again a first for us staying in a caravan, saving us taking bedding with us. The caravan was right on the beach and the big full lengths doors out onto the decking were great, waking up to the sound of the sea every morning can't be beaten, apart that is from the amazing sunsets every evening :) My boys, 5 and 7 loved it and didn't want to leave so we have already booked again for next year. Excellent quality caravan, in an excellent position. Thanks Terry, see you next year! Seeing what a great difference it makes to your holiday, makes the extra effort well worth while. Look forward to seeing you next year. We were bowled over by the views from this caravan. Cows up on the hills behind, birds circling overhead and a vast seaview looking out to North Hill and Minehead. Despite being practically on top of the sea, it was very safe for the children as there is a slope upwards and a wooden fence between the van and the path. 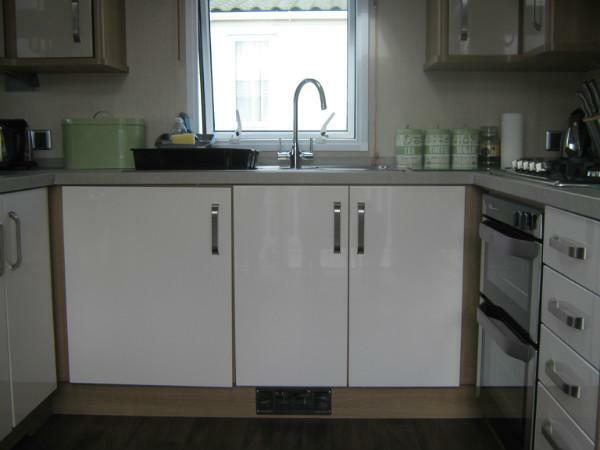 The caravan was modern and beautiful with a spacious shower, a large oven, an amazingly roomy double bedroom with two double wardrobes, dressing table, mood lighting and an ensuite. The pitch is also peaceful and quiet within easy walking access of the centre, and a short drive to the site main gate. We definitely want to come back - it was idyllic. We had nice weather but it would even have been lovely and atmospheric in drizzle. When it got too hot, there were lots of windows and doors that you could throw open. We'd brought a fan with us, but only plugged it in on one day when it was a real heat wave. Mobile phone signal was variable for us. Suggestions? we thought a long handled brush would be useful as well as the vacummn cleaner. This is the first time we have stayed at this site and I am sure it won't be the last. We have stayed in many caravans over the years and would put this at the top of the list. Many provide bed linen and make up the beds for your arrival, but this is the first time we have come across towels and tea towels being provided, plus tea, coffee, biscuits and milk for when you arrive. As we were staying two weeks, a change of bed linen and towels were provided as well. Having read all the reviews to date, we would agree with all the comments made. We hope to be making a return visit in the not too distant future. Yes I do hope it won't be the last time. It was a pleasure to have you stay with us. can not fault the caravan, well worth the money, everything you need was there. thanks so much terry. So pleased you enjoyed your stay. Hope to see you again. Just returned from a fabulous week staying in this wonderful 'home from home' situated in one of the best positions on the park. Relaxing in the evening with the patio doors open looking out on stunning sea and countryside views was just what we needed! Very spacious caravan and very comfortable. Terry and Julie were friendly and helpful and it was a great bonus to have the beds made up and towels, milk and tea/coffee etc all provided. The park itself is so well kept and really well laid out and is well situated for other nearby attractions. Thank you Terry and Julie; will definitely be back! Yes, I agree it is beautiful isn't it. You capture the scene so well. Yet again our second visit to this caravan this year, I have to say its the best ever. Warm welcome from Julie on arrival. This is the perfect holiday break for everyone young and old, The caravan has everything you could wish for its homely, clean, spacious, comfortable, warm, fantastic storage and much more. The owners Terry and Julie are warm and welcoming at all times. Top marks are always given. We like to get away to Doniford at least 5 times a year and after finding this caravan would not be happy to stay anywhere else but here, rating it 100%. I am very fussy where I stay but don't take my word try it for yourself. Amazing holiday again from start to finish thanks to Terry and Julie. Missing you already. Come back! This is the second time we have stayed in this caravan and just as our last visit it was fantastic. All the personal touches were again in place, tea, coffee, biscuits, tea towels, hand towels, bath towels, bed linen. The addition of tv's in both bedrooms was an added bonus! It really is a home from home. Having been last year in August I did wonder if we would be able to make use of the decking and sit outside admiring the view with it being April but the weather was kind and we managed a good couple of cups of tea outside! My 5 year old son refers to this caravan as 'that nice man Terry's caravan' and often asks to return, you get a fantastic welcome on arrival and this caravan certainly is still the best we've ever stayed in. Our second visit and I'm sure it won't be our last. Of course, you must do as your son asks! Fantastic holiday from start to finish. We had a very warm welcome from Terry who was very helpful not only in explaining everything in the caravan but also giving us advise about the campsite and showing us the facilities. The caravan is of 5 star quality with every personal touch possible,drink facilities and biscuits, towels, toilet rolls, bedding. There is a television in every room. The views were amazing and we did see the waves spraying over the rocks at one point.One thing that I would have liked and this is only a personal choice is a hoover but yes we will definitely be coming back without a doubt. Thank you for a lovely holiday. Come back in the Autumn or Spring and you will see and feel the waves spraying over the the rocks. A vacuum cleaner as now been provided. No, seriously though, come back, please! On our arrival we were greeted with a lovely warm welcome by the owner Terry. He gave us a tour of the caravan & the park facilities which was very thoughtful he looked after us really well making sure we were well provided for, so personal touches like this goes along way in my book. We received complimentary items such as Bath/Hand and tea towels, tea coffee and sugar even biscuits. what a lovely and thoughtful gesture. The caravan was top class with all its mod cons & more giving my family and I an amazing getaway with breath taking views of the sea and countryside. I cannot wait to book again in the near future as my family & I wish so much we were back there right now. Thanks Terry for an absolute amazing time. I highly recommend booking this caravan with terry if you want to be treated with 5 star treatment whilst you are on holiday. Thank you for your very kind review. I will try hard to maintain my standards. Absolutely the best! You will not find a caravan of this quality with this location for the price Terry charges! And speaking of which Terry was the most welcoming of caravan owners we have met, the park itself is well maintained with plenty of activities. We would definitely recommend a stay here, thank you for making our weekend fantastic! You know, it's easy to be welcoming when guests are as nice as you. we received a very warm welcome from terry the owner on arrival. greeted with a smile and given the tour of van. provided tea coffee milk sugar toilet rolls ect. the van itself was clean, tidy, very well equipped. views were stunning sight great but what made our holiday was feeling home from home in a very comfortable clean van. bed was comfy plenty of space in the rooms. all modern well executed layout of furniture. central heating throughout fire in lounge, tv in every room. a absolute pleasure to stay in can not wait to book again, we would highly recommend it to family and friends anytime. in fact we want to book the whole family on sight in his vans loved every minute. best one we have stayed in yet on the sight. given you all pros now cons well there are not any brilliant from start to finish. rating top in our books 100/100. I was so pleased you did bring your family back to stay in two of my caravans. What a lovely family you are.